The 2 TB Biggest Quadra External Quad Interface RAID Array from LaCie is an external 4-disk array that delivers a fail-safe storage solution. As configured, the array offers an impressive 2 TB of storage spread across four drives, all of which are hot swappable. 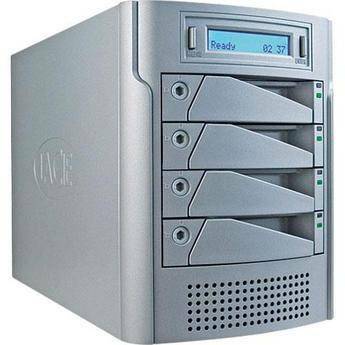 The array features a quad interface which allows it to be connected via eSATA, FireWire-800, FireWire-400, or USB 2.0. It is capable of burst transfer rates of up to 80 MB/sec when connected via eSATA. The array can be configured in a variety of schemata, including RAID 0 and RAID 5. These features and more make the array a great solution for your large data storage needs. The array features four interfaces for the ultimate in compatibility: eSATA, FireWire-800, FireWire-400, and USB 2.0. eSATA and FireWire-800 offer the highest transfer rates, while FireWire-400 and USB 2.0 are available for broad compatibility. By using redundant hot-swappable drives the array protects your data and makes it easy to replace a drive and the data that was on it in the case of a failure. The array supports RAID 0 disk striping for maximum transfer speeds. It also features RAID 5 for real-time data protection. RAID 0+1 and RAID 5+Hot Spare are also available. The hard drives are hot swappable, allowing constant operation while equipment is being replaced. The compact desktop design allows you to easily implement the array into your work environment.